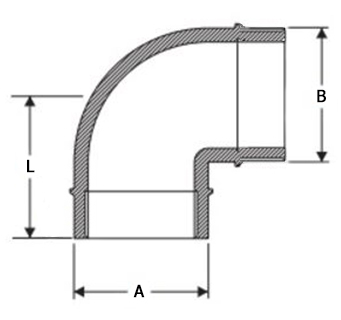 This threaded elbow allows for redirection of a run of pipe at a 90° angle. Male threaded one end and Female threaded on the other. BLK PP Elbow 90 M x F Thread 1/2"
BLK PP Elbow 90 M x F Thread 3/4"
BLK PP Elbow 90 M x F Thread 1"
BLK PP Elbow 90 M x F Thread 1 1/4"